Kofi Annan reflects upon the so-called “African Green Revolution” and the nine necessary steps to achieve food security in the continent. Leaders meeting in Davos this week are confronted with some critical challenges. One of them is how to realise the bright prospects of African agriculture. Investment in this sector has doubled in the last decade as governments recognise the crucial importance of agriculture to the well-being of the people, social stability and economic growth. Yet for all the progress in recent years, hunger remains widespread and Africa is the only continent which cannot feed itself. It is hard to understand how the continent with 60% of the world’s uncultivated arable land still suffers so badly from under- and malnutrition and spends $35b every year importing food. So which are the barriers preventing Africa from realising its potential to not just feed itself but begin exporting to the rest of the world? How can we make Africa the world’s new bread basket? Shortly after the African Union’s Summit in Malabo, which saw bold commitments to end hunger by 2025, through accelerating agricultural growth and transformation, I met with leaders from the public and private sector at the African Green Revolution Forum 2014 to discuss strategies to make this happen. This week we are publishing the report on the outcome of these discussions. It is a detailed report but it was clear that urgent action is needed on some fundamental areas if Africa is to reach its agricultural potential. First, the role of small-holder farmers, who make up the vast majority of farmers, is crucial. Governments and the private sector can develop partnerships and expand links with smallholders and farmers’ organisation, filling critical gaps along the food system value chain. The greatest success will come, if bigger farms share market access, technology and knowledge with smaller farmers. Second on the list and this comes as no surprise, is the need for better rural infrastructure. Bring the booming economy to the hinterlands by connecting thousands of farmers to a viable road network, power grid, irrigation systems and essential infrastructure. A government investing in these areas will earn huge returns. Third, to create an environment conducive to agricultural productivity growth, governments need to put into place institutions and policies that are far-sighted, can be sustained beyond the tenure of particular elected officials and promote long-term benefit over short term gain. Fourth, increase access to financial services for farmers and growing agri-businesses. Without it, we cannot expect higher yields or better nutrition. Enable a farmer to acquire good seeds and use soil fertility enhancing measures is the first step out of poverty. Fifth, now – and even more so in the future – successful farmers are those who find viable solutions to dealing with climate change. Climate change is already impacting weather patterns and growing seasons in Africa and around the world. Climate-smart agricultural solutions can improve food security and farming resilience by increasing productivity compared to conventional approaches. Sixth, regional barriers, from tariffs to transportation cartels, are restricting trade. If a farmer cannot sell his produce in the next country, it is much harder to develop a profitable business. Seventh, mobilise our young people and empower the women. When a continent has both the highest rate of youth unemployment and an agricultural sector desperately in need of more labour, something is amiss. Women make up the large majority of smallholder farmers in most African countries. They are the ones who put food on our tables and must be supported much more effectively. More investment is also needed in training and technical support targeted at Africa’s young generation. Eighth, give those in the agricultural sector better access to information, via mobile phones and the internet. If we do, they will find the ways to revolutionise farming, food production and the rural economy in the way technology and consumer power changed Africa’s banking industry. Lastly, increase yields without harming the environment by investing in applied research. Developing locally adapted varieties that are also drought tolerant will be increasing important priorities as the impacts of climate change become more extreme. The goal must be a uniquely African green revolution which successfully adapts global experiences – good and bad –to local conditions. It is a vision which decisively shifts away from subsistence farming to growing profitable businesses. It puts small-holder farmers at its heart and understands that larger enterprises also have a major part to play. Tackling these points will not just feed people in Africa but turn the once starving continent into the world’s agriculture powerhouse. Africa is potentially an agricultural powerhouse. The continent has 60 percent of the world’s uncultivated arable land and could grow enough food to meet its own needs and export surpluses. Yet hundreds of millions go hungry. Despite recent progress, Africa’s farmers, most of whom are smallholders, underperform. 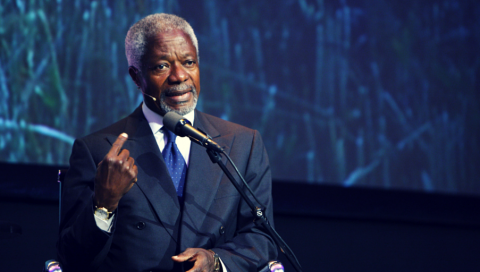 The Kofi Annan Foundation advocates the transformation of African agriculture to ensure food and nutrition security for all by mobilising leadership and high-level commitment. We bring together leaders from the private sector, civil society and the political sphere to trigger cooperation that benefits farmers and the general population.